Hyderabad’s real estate market has yet again emerged as a stable one. After gross capital values slipped by 1 per cent in Jul-Sep 2014, the market regained by 2 per cent in Oct-Dec 2014. Though the stability of the State Government has improved customer sentiments, sale volumes still haven’t picked up pace. Gripped under political imbalances, Hyderabad has been through the slowest phase of real estate movement in the last few years. Infrastructural developments, acquisition of land for industrial corridors and enhanced office space absorption were some of the macro factors that worked in favour of Hyderabad’s realty in this quarter. In terms of residential real estate, localities such as Kukatpally, Manikonda and Miyapur performed the best in the current quarter. Property prices in these localities went up by nine per cent to 11 per cent. All three localities lie at a convenient distance from the IT corridors Gachibowli and HITEC City. They offer seamless connectivity along with well-built social infrastructure, and therefore, command maximum end-user interest. Miyapur also scored high on preference from homebuyers due to its comparative affordability to Hafeezpet and HITEC City, located five and 11 km away, respectively. The upcoming Hyderabad Metro Rail and Intercity Bus Terminal also resulted in enhanced demand. Dilsukh Nagar remained the top non-performer of the city and saw prices dropping by 11 per cent. Chaotic roads and long traffic jams continued to act as a major deterrent for this locality. Constituting nine out of the ten positions of top performers of the city, West Hyderabad showed the most robust residential real estate market. With the software industry concentrated here, maximum housing demand as well as supply was noted in this region of the city. 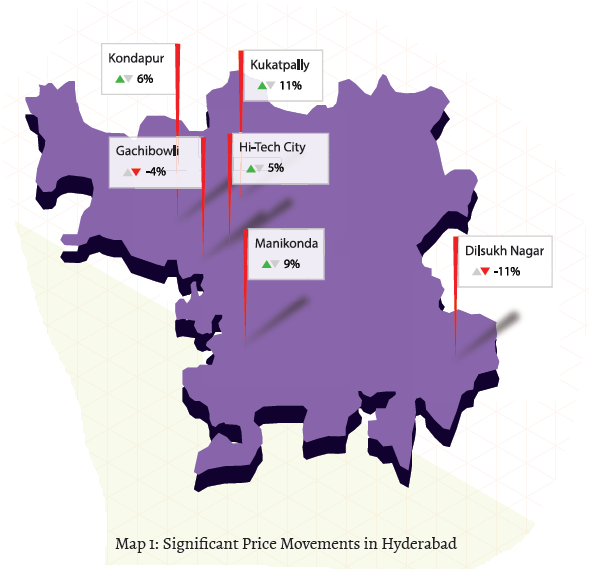 “West Hyderabad remained the top performer with Kukatpally, Manikonda and Miyapur recording 9%-11% price rise. Maximum new launches also recorded in the West." After recording a slight drop in the previous quarter, Kukatpally picked up pace in Oct-Dec 2014 and recorded an appreciation of 11 per cent. The anticipated reduction in travelling time and traffic snarls due to the upcoming metro was the major reason pushing housing demand here. Manikonda, which witnessed a nine per cent hike in property prices in the present quarter, probably owed it to the increasing rental demand in the locality. This is visible from the fact that in the last one year, the lease values in Manikonda have gone up by 25 per cent. Overall, high gross yield in the form of a recurring income, along with affordable property prices has worked in favour of the locality. Easy access to the Outer Ring Road (ORR) and proximity to Gachibowli, HITEC City and Jubilee Hills are the major attractions for end-users in Manikonda. Though Kukatpally Housing Board Colony (KPHB) emerged as one of the top performers in this quarter, its growth over a span of last six months has been almost stable. While the locality witnessed an appreciation of six per cent in the Oct-Dec 2014 quarter, it had dropped by seven per cent in the Jul-Sep 2014 quarter. However, on a year-on-year basis, the locality has witnessed almost 17 per cent appreciation, which could be attributed to its improved connectivity via the KPHB-HITEC City flyover. Jawaharlal Nehru Technological University (JNTU), located in KPHB, also resulted in the nearby area to clock an appreciation close to eight per cent in this quarter. Kondapur managed to retain a spot in the list of top performing localities of the city. While the locality registered insignificant hike in the previous quarter, it clocked an appreciation close to six per cent in this quarter. Several new residential project launches by developers such as SVC Ventures, Prime Group, Trishala Infrastructure and Lore Infra hint towards the robust housing demand recorded here. Preference for Kondapur can also be seen by the rental value movement between Oct-Dec 2014 and Oct-Dec 2013 and land value appreciation since the previous quarter. The rental values have gone up by eight per cent owing to its convenient access to the software hubs of the city in the west. Plotted developments too are priced 17 per cent higher than Jul-Sep 2014, mostly due to insufficient supply. “With Telangana Government announcing development of new cities, temple towns, industrial parks and other infrastructure projects in the city, the land values have gone up by 11%." Being one of the most coveted residential addresses in the city, HITEC City recorded stable growth over the last one year. While the property values rose by five per cent in this quarter, they changed by an average of one per cent on a year-on-year basis. With majority supply of ready-to-move-in properties and comparative affordability to Jubilee Hills, Madhapur continued to be a popular choice amongst middle-income homebuyers preferring to stay near Gachibowli. The prices in Madhapur were almost 30 per cent lower than Jubilee Hills and registered a hike of five per cent in the Oct-Dec 2014 quarter. Cost feasibility and well-fabricated social infrastructure also impacted the rental values in Madhapur which went up by 15 per cent in the last one year. Pragati Nagar was the only locality from North Hyderabad which managed to grab a position in the top ten performing localities of the cities. Proximity to Kukatpally and affordable property prices have been the major attractions for investors in Pragati Nagar. Over a period of one year, the locality witnessed an appreciation of 17 per cent. However, in the present quarter, the growth has been slow (four per cent) due to unsold inventory. After Dilsukh Nagar, Bachupally and Lal Bahadur Nagar recorded the maximum drop in property prices (eight per cent each) in this quarter. Though Bachupally is popular amongst end-users for its affordable ticket size, the extent of unsold units has forced developers to negotiate and reduce the asking rates. Availability of surplus stock has also impacted the asking rates in the secondary market. Looking at the expanding industrial activities beyond the ORR, Bachupally holds a healthy potential to appreciate in future. LB Nagar, on the other hand, has scored lower on buyer’s preference due to unplanned retail developments and, therefore, overcrowded societies. The locality is expected to reap healthy returns once the metro connecting SR Nagar and LB Nagar gets functional in 2016. Despite being a major growth driver in the western region of the city, Gachibowli recorded a consistent but marginal drop in property prices since the last six months. While the locality saw prices dipping by one per cent in the previous quarter, this quarter witnessed a dip of four per cent. Oversupply of housing units is probably the major reason why the prices in the locality are not getting a thrust. For the same reason, even rental rates in the locality remained unchanged in the current quarter. Chandanagar offered properties at prices notch lower than Kondapur, located 5 km away. While the prices in Chandanagar were around Rs 2900 per sq ft, that in Kondapur were close to Rs 3600 per sq ft. Comparative affordability spilled demand to Chandanagar, especially from the middle income homebuyers who sought the best prices available in the market. Narrow roads and paucity of water supply made homebuyers reluctant about Nizampet, which otherwise offered affordable options. The market remained almost stagnant over the last six months. While there was no change reported in the last quarter, there was a marginal dip of four per cent in this quarter. Over the last one year, the prices moved insignificantly by two per cent. With several similarly priced localities available in the west, south Hyderabad recorded lower demand. Therefore, Attapur, a well-connected locality in the south, recorded reduced buyer interest and hence a slight dip in property prices. However, over a period of one year, the prices hiked by 11 per cent. Appa Junction and Alkapur, also located in the south, witnessed a stagnant market in this quarter. In fact, over a period of one year, the prices in these two locations witnessed an insignificant hike of two per cent to three per cent, hinting towards almost nil buyer interest. In terms of land prices, Warangal Highway outperformed all other areas of the city. The area majorly offers plotted developments. The upcoming Outer Ring Road, which was slated to be completed by end of 2014, has now been rescheduled for 2015 and has been acting as a major catalyst for land values. The upcoming Multi-Modal Transport System (MMTS) is also expected to boost property prices in the area. Kothur also recorded a considerable hike of 25 per cent in land values. Availability of Hyderabad Metropolitan Development Authority (HMDA) or by Directorate of Town and Country Planning (DTCP) approved plots attracted several investors. Affordable prices were another reason why investors flocked to Kothur in large numbers. The area offers plotted developments within a price bracket of Rs 5-30 lakh. Adibatla, a part of the Information Technology Investment Region (ITIR), recorded a 20 per cent jump in land values after Congnizant acquired land for developing office space here. 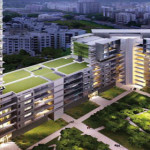 The locality is touted to be the next software hub after Gachibowli and HITEC City. Already, Tata Consultancy Services (TCS) has started the construction of their office space here. Other localities which recorded a marginal hike in their land values were Beeramguda, Mokila and Gachibowli. With land values as low as Rs 750-1000 per sq ft, individual buyers preferred purchasing in these IT industry driven localities for a premium living and healthy return on investments. Oversupply of plotted developments led to a nine per cent drop in land values in Shamshabad. 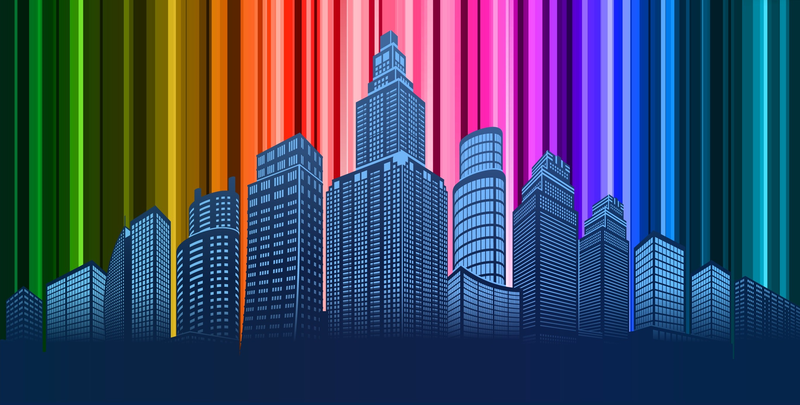 Presently, Hyderabad’s real estate market is dependent on the IT industry. With focus on development of industrial corridors in areas such as Ranga Reddy District, Pocharam, Shamirpet, Medchal, Muchherla, Mahabubnagar and Kadthal, there is an anticipation for growth in the otherwise slow market. IT, aerospace, pharma and FMCG sectors are together expected to generate ample job opportunities to boost the residential market. Supply of residential apartments surpassed availability of independent houses and builder floors in Hyderabad. While the city witnessed maximum supply of houses falling in the price bracket of Rs 25-40 lakh, 2 and 3 BHK units constituted more than three fourth of the total market. Supply of various property types such as apartments, builder floors and independent houses/ villas remained unchanged between the last and the current quarter. While apartments were the most supplied and constituted majority (62 per cent) of the total market, independent houses/villas were the next most supplied and made up 32 per cent of the market share. Across all major cities, Hyderabad witnessed maximum supply of independent houses/villas. Chennai was the closest to Hyderabad with 22 per cent supply for this property type. The middle income housing segment of Rs 25-40 lakh saw maximum supply in the city. The category made up almost one third of the total market share in this quarter. Within this budget, close to 54 per cent properties were under construction. 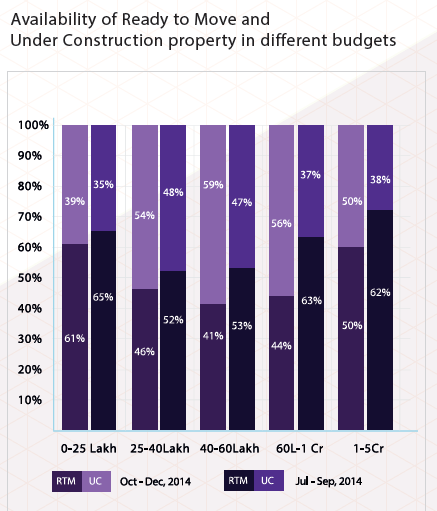 The share of under construction properties in this budget rose by six per cent since the last quarter. The next most supplied budget category was the high income housing segment (Rs 40-60 lakh) which made up a quarter of the total market share. The category offered a ratio of 40:60 for ready to move in and under construction properties. There was a marked drop of 12 per cent in the number of properties being constructed in this category, since Jul-Sep 2014. The affordable housing segment (Within Rs 25 lakh) recorded 18 per cent supply in this quarter, out of which close to 60 per cent were ready to move in and the rest were under-construction. The luxury housing segment (Rs 60 lakh – Rs 1 crore) constituted 16 per cent of the total inventory in this quarter. There was a considerable hike of 19 per cent in the number of properties being constructed in this budget range. The ultra-luxury budget category of Rs 1 crore - Rs 5 crore witnessed lowest supply in the city owing to smaller ticket size. The share of ready to move in and under construction properties was absolutely balanced in this segment. Overall, the city recorded an almost equal share of under construction and ready to move in units. Close to 48 per cent properties available for sale were under construction, with the rest (51 per cent) being ready to move in. 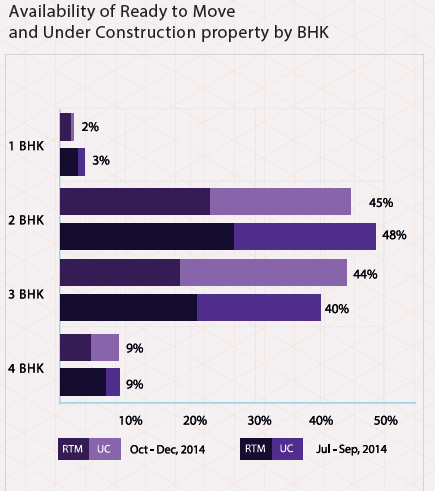 Out of the total under construction properties, one third fell in the mid income segment category of Rs 25-40 lakh. However, there has been a marked drop in supply of under construction properties in this budget by seven per cent since Jul-Sep 2014 quarter. The share of under construction properties went up in the luxury housing segment (Rs 60 lakh - Rs 1 crore). While the Jul-Sep 2014 quarter saw 13 per cent units under construction in this budget, this quarter saw 18 per cent units being constructed for this bracket of buyers. The city saw least number of properties being constructed in the affordable budget range, within Rs 25 lakh and the ultra-luxury housing segment, Rs 1 crore - Rs 5 crore. In case of ready to move in units, the distribution across various budget categories remained almost stable between the two quarters. 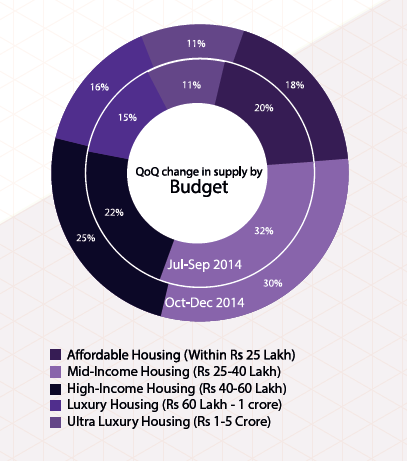 The affordable and mid income housing segments constituted almost half of the total supply. In terms of configurations, maximum supply was recorded for 2BHK and 3BHK units. Both the categories together made up almost 90 per cent of the total market share, with almost equal supply of each. 1BHK units were the least offered in the city and were mostly available in ready to move in state. Only one fifth of the total 1BHK units were under-construction. In the 2BHK and 4BHK category, more than half of the supply was for ready to move in units. The supply of under construction properties in the 2BHK category went up by eight per cent in the current quarter and in the 4BHK category by 16 per cent. The 3BHK category consisted majorly of under construction properties. 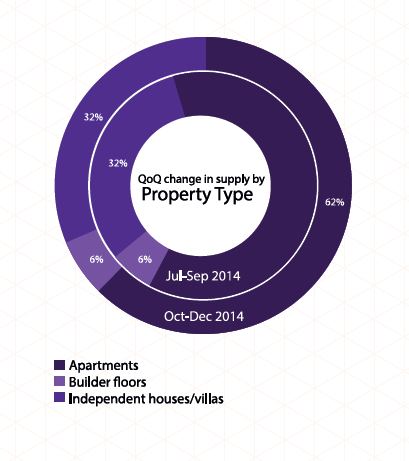 The share of under-construction properties rose by 12 per cent since the previous quarter. “After Telangana, the city saw several new launches, especially in the West. Almost half of the total properties on sale are under construction presently." I can already tell that’s gonna be super hepfull. Buying auction properties: A smart investment idea?